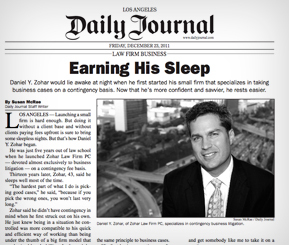 News, Publications & Press Releases - Zohar Law Firm, P.C. For media inquiries, please contact Jeanette Eun at 213-689-1300. For years Dan has fought tirelessly to protect our company's rights. He is committed to winning and never loses sight of the big picture. Whether developing legal strategy, conducting jury trials, or arguing before a judge, Dan displays masterful abilities rarely exhibited by other lawyers. He is exactly the sort of skilled and ethical advocate that corporate clients need in high stakes business litigation.